The kitchen floor of a restaurant can be very wet and greasy. There are sometimes small pieces of food that end up on the floor as well, giving conditions that aren't safe for standing. Non slip kitchen mats are ideal for restaurants, and there are a variety of mats to choose from. If you're working on the cooking line, then you need something that is grease resistant. Red anti-fatigue mats are ideal for those who work on the cooking line as they are thicker and are designed to withstand a lot of abuse that can be seen by those who stand on the mats for long periods of time. There are small holes in these mats to allow for draining. 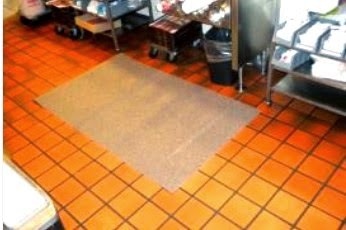 A black anti-fatigue mat is commonly seen in food preparation areas. You can get them in all sizes, but they are usually smaller than some of the other mats in the kitchen simply because this is an area that normally sees fewer people. These mats also have small holes to allow for drainage of liquids that get on the surface. Mats with beveled edges are ideal if you plan on rolling carts in the kitchen. The mats won't slip when the carts are pushed over them as the edges are flush with the floor.